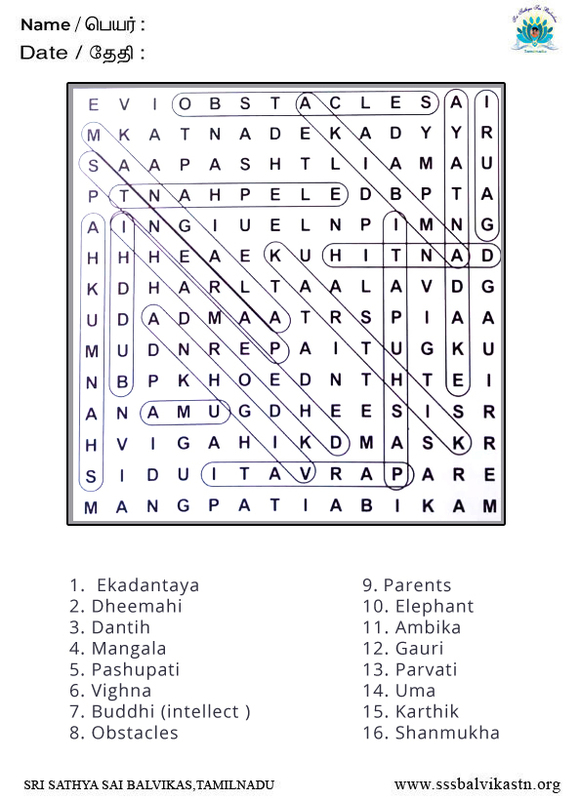 The Balvikas guru can scramble and write the different names of GANESHA on the board. Here is a memory game for 9 years and above children. The guru can explain the meanings of the names of Lord Ganesha given below. Then give them the worksheet and ask them to write the meanings of the names. The child who has written the correct meanings of maximum names will be the winner! Before the birth of the famous Emojis of today, were the times of text smileys. 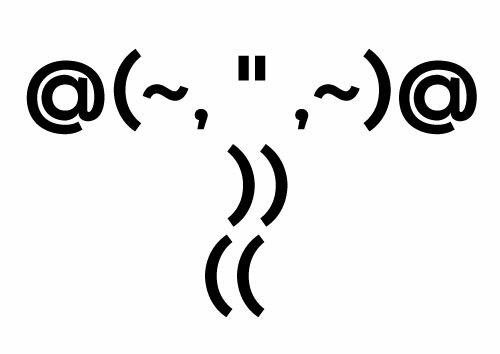 The idea and the first use of text smiley face, is credited to Scott Elliot Fahlman, a computer scientist at Carnegie Mellon University. The purpose of these smileys were to add emotions or feel, to the online communion that lacks both tone and cues. 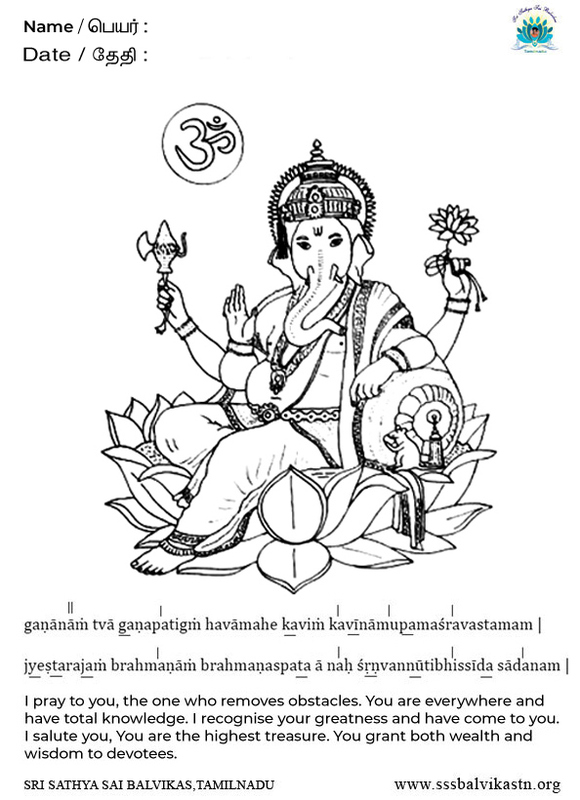 Here is a picture of Lord Ganesha put together with a bunch of standard characters and punctuations. This picture is sure to bring instant smile on our faces indicating good humour and happiness! This Vinayak Chaturthi, let's share this picture of Smiley Ganesha and spread lots of joy! Ganesh Chaturthi is a ten day Hindu festival to celebrate the birthday of Lord Ganesha, the son of Lord Shiva and Parvathi. He is the remover of obstacles and the one who brings in oodles of auspiciousness into our lives. Some families keep Ganesha’s clay idol in their homes while some keep the idol in public pandals. Special sweets like laddoos, modaks, karanjis etc are prepared to be distributed as prasadams. The immersion of the idol is done on the 10th day of the festival in water bodies. For eco-friendly reasons, people are advised to buy or make clay idols of Ganesha. This festival is celebrated with great pomp and show, sometimes accompanied with cultural events. The image of Lord Ganesha is unique as He is the only God with an elephant head. It is every artist’s delight to capture Ganesha’s image on paper or canvas. Some do it in detail while some with a few inventive strokes. 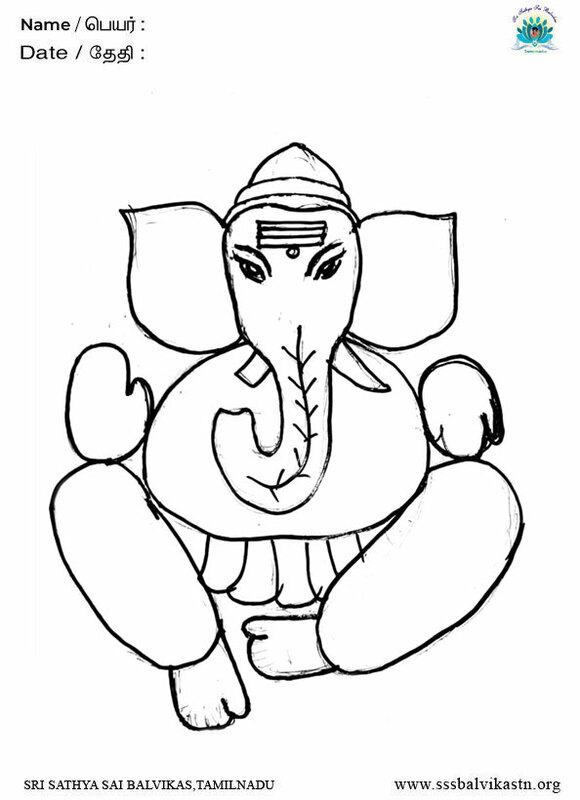 Here is a video that shows how to sketch an image of Ganesha using numbers. During this Ganesh Chaturthi festival, let your mind go on a creative spree and capture the picture of Lord Ganesha, the bestower of prosperity and wisdom! Rangoli is a traditional art form where beautiful patterns are created on the floor or ground using rice powder, dry flour, coloured rice powder, sand etc. 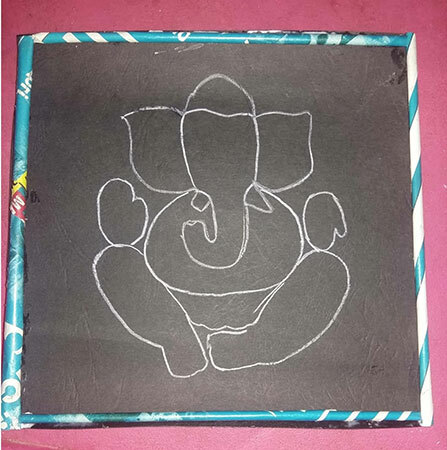 Here is a free hand Rangoli of Lord Ganesha. It's very simple and unique in style. A little decoration with stones and jewels will make it a stunning piece of art! This Vinayak Chaturthi festival, let's make this distinctive Ganesha Rangoli and spread colour and joy! Today is Ganesh Chaturthi, the holy festival. “Ga” symbolizes Vidhya or knowledge and “Na” symbolizes Vignana or the spiritual knowledge. Ganapathy is the master of the intellect as well as spiritual knowledge. 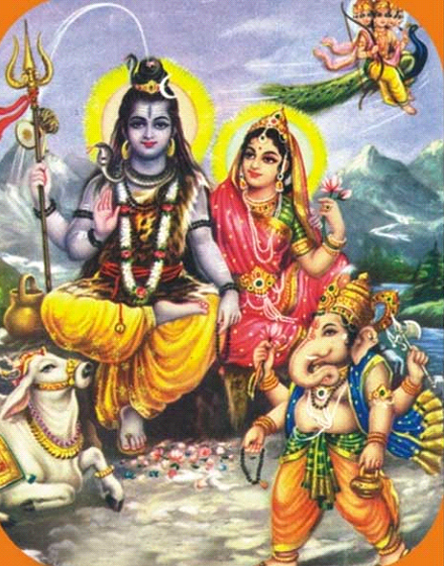 Ganapathy is also the master of Ganas, the attendants of Shiva who live in Mount Kailash. The whole universe is sustained by the Ganas. So Ganapathy is the master of Ganas who maintains the cosmos. Everyone has a master or a Guru over him except Ganesha who has no master. Ganesh Chaturthi is the birthday of this master of masters who has none above him. Ganesha’s chariot is Mooshika or mouse. Hence, he is lovingly also addressed as Mooshikavahana. Mooshika or mouse also symbolizes dark night. Rats and mice move about in darkness. This darkness actually means the darkness of ignorance. Once we understand the inner significance and nature of Vinayaka we can have complete fulfilment in the worship of Lord Vinayaka. We should understand both the intellect as well as the wisdom. During Vinayka Chaturthi, we make special offerings to God. It is interesting to know that no offering is made out of oil. The offerings are not fried in oil. Til seeds are grinded and is mixed with Jaggery and rice flour and the sacrificial offering is steamed and the popular sweet kudumulu / undrallu is prepared. Since this offering does not have any trace of oil, it is a healthy dish. Since Vinayaka eats oil free food, He stays healthy! The steamed sweet made with til seeds is curative for eye ailments. The steam helps in proper digestion and assimilation of food in the body. Boiled and steamed food is also a cure for blood pressure as well as blood sugar. Oil in the body leads to heat in the body and this heat will lead to many diseases. Therefore to stay healthy it is important to have very less oil and to stay away from fried food. This is the secret or principle to a long life! 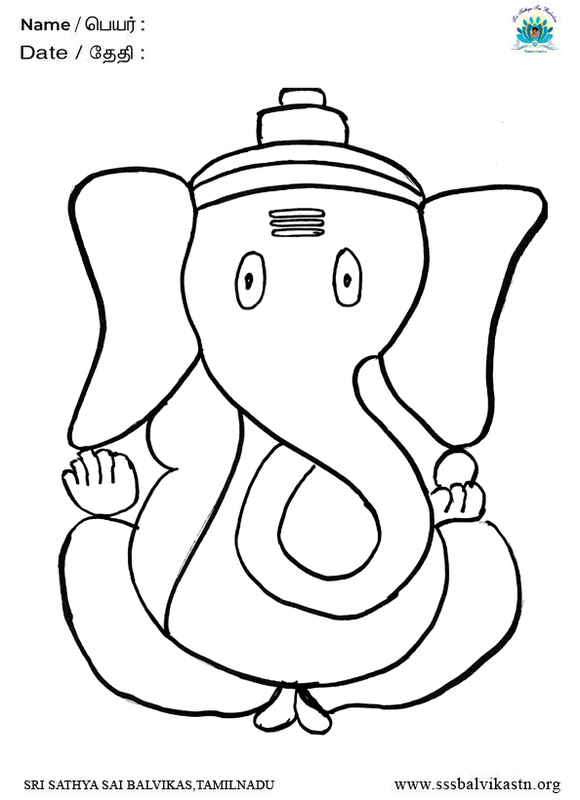 Vinayaka partakes only such oil free food and though he has a big tummy he is healthy. He is also called as Vigneshwara which means there is no obstacles or problems on his way to bliss and happiness. All of us can be free from obstacles and attain success and achievement in our life, by praying to Vinayaka. God manifests in two ways. One is inward and the other is outward. Outward manifestation means “the body” and inward expression is “the intellect”. That which is related to the intellect is changeless though physical changes happen quite often. By controlling our mind and making changes in our food and other habits, we can reduce body weight. The main cause of over weight is food and other habits. When we are overweight, our heart may not be in a position to pump blood. When our heart pumps blood, it reaches 12,000 miles. The body gets tired in supplying blood to 12,000 miles. With increase in obesity, blood circulation becomes a problem. Obesity makes the heart weak. Heart beat increases due to overweight. Every heart beat supplies blood to 12,000 miles. We should ensure that our heart does not do over work. This is the job of Vinayaka. We eat more and we face problems with our health. But Vinayaka does not have such problems. The actions of Vinayaka has the subtleties relating to maintenance of good health. We should exercise control over our food habits. Any leftover or excess food is given to the rat or mouse. Rats helps Vinayaka by being His vehicle. A small rat carries a huge bodied and mighty Ganesha. Have you ever paused to think about this unique sight? What does it actually mean? Swami lovingly explains. We look at rat in the literal sense as a small animal. The inner meaning is that, the rat symbolizes the darkness of ignorance. It moves about in darkness. Meaning, ignorance by itself is s a heavy load or burden. Mooshika Vahana is one who removes ignorance and darkness. So this festival of Ganesh Chaturthi has lot of inner significance. Today, a special worship is made by offering the grass Garika to Ganesha. Let’s find out the story behind it. 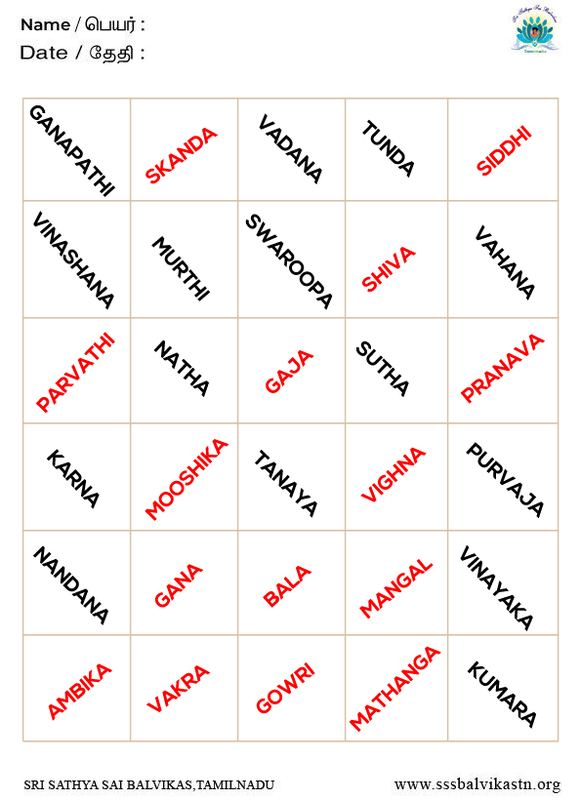 Long, long ago, Mother Parvathi and Parameshwara were playing the game of dice. They decided to keep Nandi, the vehicle of Shiva as the umpire. After the game, Nandi declared Shiva as the winner. His enraged Mother Parvathi and she accused Nandi of cheating. She further cursed Nandi to suffer from ingestion. Nandi told Mother Parvathi that he did not use deception and to free him from the curse. He further explained that the will of God is so strong that it can never change. God’s WILL, will happen! Mother Parvathi softened and told him that on the 4th day of the month of Bhadrapada, he should worship Vinayaka with Garika or white grass and he will be freed from indigestion when he partakes the grass offered to Vinayaka. It is a common sight to find pet dogs searching for this particular grass and eating it. This grass is beneficial to their digestive system. Vinayaka Chaturthi confers health and prosperity to one and all. It is said that, on the 4th day of Bhadrapada month, if we pray to Ganesha, we will be recipients of munificent blessings of Ganesha. Swami says that history is sacred and has in it, subtle secrets. Nowadays, students are not reading histories but rather are reading novels and stories that are meaningless. History shows the divine path. Swamis says, “What is History? It is His story!” Students should read the epics, the Bhagawatha, Ramayana and Mahabharata for spiritual knowledge. Vinakaya is very wise and Vinayaka Chaturthi has the message of all the three epics. None can excel him in His wisdom. He is full of supreme intelligence. All the devathas and deities worship him. On Vinayaka Chaturthi, students keep the text books etc. in front of Vinayaka idol. They make offerings and partake it. It is done to get the wisdom of Ganesha. It is most essential that students worship Vinayaka. Vinayaka has no desires. He has no expectations. He in fact, fulfils all our desires. We have to worship God who confers grace. Anugraha or grace is more important and not Agraha which is anger. This sacred festival is celebrated not only in India but in many places as well. The teachings of Vinayaka is so profound that every letter in it is priceless and sacred! Gurus can explain Narayana Seva to the children and how these vegetables are going to be used. The children can be taught a shloka or a bhajan on Ganesha or a story. The students in the class should be divided into groups according to the strength of the class and name the groups. Once the distribution is over, let them all take a look of all the Vegetables given. 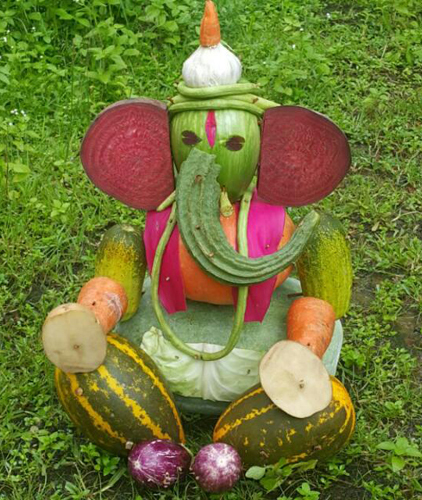 Show the children different pictures of Lord Ganesha and explain to them that they are supposed to form the shape of Ganesha with the given vegetables. The Guru can also teach a sloka or a bhajan on Ganesha or even tell a story. The students in the class should be divided into groups according to the strength of the class and the groups can be given names. 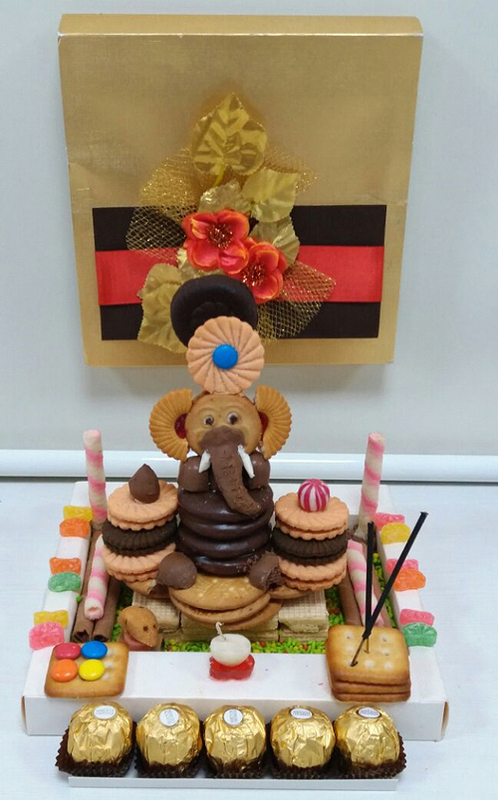 Show the children different pictures of Lord Ganesha and ask them to form the image of Ganesha with the given biscuits. Every student can offer Pooja to the Ganesha that they have made. The final part comes the Visarjan, the immersion of the Lord’s idol. Here in our case the Visarjan can be, distributing the Biscuits and Chocolates among the children and if possible to the poor as well. Any leftover or excess food is given to the rat or mouse. Rats helps Vinayaka by being His vehicle. A small rat carries a huge bodied and mighty Ganesha. Have you ever paused to think about this unique sight? What does it actually mean? Swami lovingly explains. We look at rat in the literal sense as a small animal. ave you ever thought of this Even though the rat is small it carries the mighty Ganesha. The inner meaning is that, the rat symbolizes is the darkness of ignorance. It moves about in darkness. Meaning, ignorance by itself is s a heavy load or burden. Mooshika Vahana is one who removes ignorance and removes darkness. So this festival of Ganesh Chaturthi has lot of inner significance. Today, a special worship is made by offering the grass Garika to Ganesha. Let’s fine out the story behind it. Ganesh Chaturthi is a festival celebrating the birthday of Lord Ganesha. Lord Ganesha’s idols are kept at homes or in public places for maximum of 10 days or less and then the idol is immersed in a water body. This is known as Visarjan. Today, people have realized that along with religious beliefs it is important to keep in mind the need to save and protect our environment. Traditionally, Ganesha idols are made of plaster of Paris, painted and decorated with glitters. When these are immersed in water bodies they pollute the water. A better idea is to go for Ganesha idols made with mud, clay or paper pulp. This ensures that our water bodies are saved. Our health is also protected and it allows the aquatic animals and plants to continue thriving in water. The good news is that we can make Ganesha idols out of clay, right in our homes. And in case you wish to know exactly how to make one easily, we have a video here that will help. It explains step by step how to make an endearing Ganesha idol right in your home with just clay! Apply glue using brush on the face and trunk of Ganesha, spread wheat over it and pack it tightly with stick. Apply transperant glue on the grains with brush and leave it to dry for another two days. This is to prevent the craft from insects. Frame the craft and hang on the wall. The importance of listening and being able to communicate what we heard. Chinese whisper is an all-time favourite game with children. They never seem to get bored of it. It is a game where children sit in a circle. 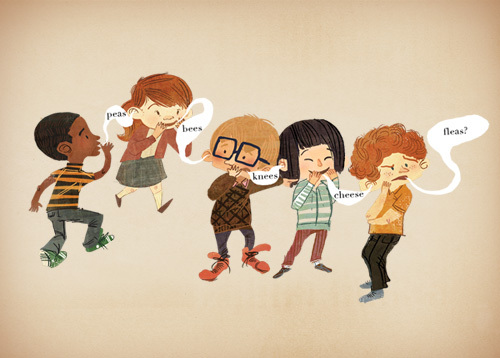 One child whispers a word or a sentence or few sentences (the difficulty level can change to suit the age of the children) to the next child. This child will whisper what he/she heard to the next child. The turns should go clock wise. The last child will tell aloud what he/she heard. If it is the same as what the first child had said, it means everyone has heard it right. Else the previous child can say what he/she heard till the person who heard it wrong is found. During Ganesh Chaturthi, the children can play this game of Chinese Whispers with words or sentences relating to this beautiful festival. Eg: We went to Ganesha Temple. They were giving modaks as Prasad. I got 4 modaks. They tasted yummy. As mentioned earlier the difficulty level can change. For very young children, it could be “We went to Ganesha temple. They gave modaks as Prasad”. 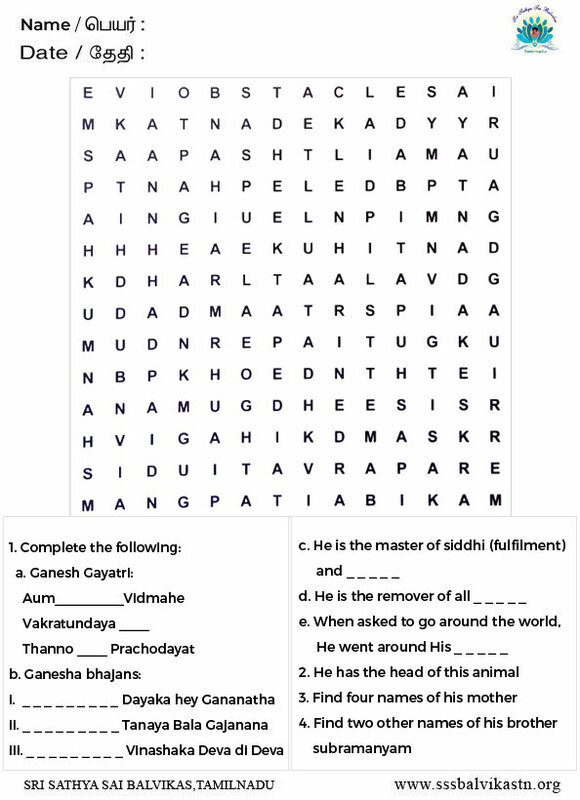 One can use one’s imagination and come up with any words or sentences relating to this festival! Lord Shiva and consort Parvati in Mount Kailash. Sage Narada arrives at Kailash. : Narayan, Narayan, salutations to you, Oh Lord Shiva and Mother Parvati. : Narada, welcome to my abode! Well, what brings you here today? : Pardon me, Oh Lord but I have with me , a precious fruit brought from Vaikunta. I shall hand it over to Mother Parvati with a request that it may be given to a worthy person who is most intelligent and wise. That is my only wish. :So, be it Mother Parvati. Narada, you have come at the proper time. I wish to seek a leader for my thousand Ganas also. Someone who is proficiently and eminently suited. : Pray Lord Shiva, what are the qualifications you are looking for, in such a leader? : The Leader of the Ganas should possess great Buddhi or Intelligence. He should be highly auspicious and compassionate and possess a calm and benign nature most worthy of veneration by all. : Pardon me Lord, but I find only two persons worthy of such eminence and veneration.They are your own two sons, Gajanana and Subramanya, both most eminently suited to occupy the position of the Lord of the Ganas. :Yes, both seem to be worthy and intelligent. What have you to say Mother Parvati? : Lord, I am indeed proud of Gajanana and Subramanya. They are both worthy of the highest and deepest veneration not only on earth, but also in the heavens. Everywhere in Bhooloka we hear nothing but praises and admiration from the mouths of the llen and the pious for both of them to me. They are both worthy of being the chief of the Ganas. : Son Subramanya and son Gajanana, come to me. I have a task for you, which I want both of you to accomplish to the best of your ability. Whoever finishes first will receive this fruit as a gift from Narada as well as be appointed as the Lord of my thousands Ganas. Here is the test: I want you both to go around Bhooloka three times successively and come back. He who accomplishes the feat in the shortest possible time, will be declared the winner. I bless you both. :Gajanana, why are you sitting here? Are you not keen to race with your brother? truly worthy of our highest reverence and respect. : Gajanana,arise. I am very pleased with your words as well as your actions. You have proved to me beyond doubt that the jnana Bhaskara is indeed in full bloom in your heart. Your spiritual knowledge is wide, deep and matchless. Your courage of conviction, clarity of thought and boldness of action marks you out as a hero of outstanding merit and abilities. By your actions you have accomplished my task with the greatest forethought and Viveka. From this moment, I appoint you commander-in chief of all my thousand Ganans and name you Ganapathy or Ganesha, the Lord of Ganas and here is the fruit from Vaikunta. Gurus can have discussions on different names of Ganesha and the meaning. 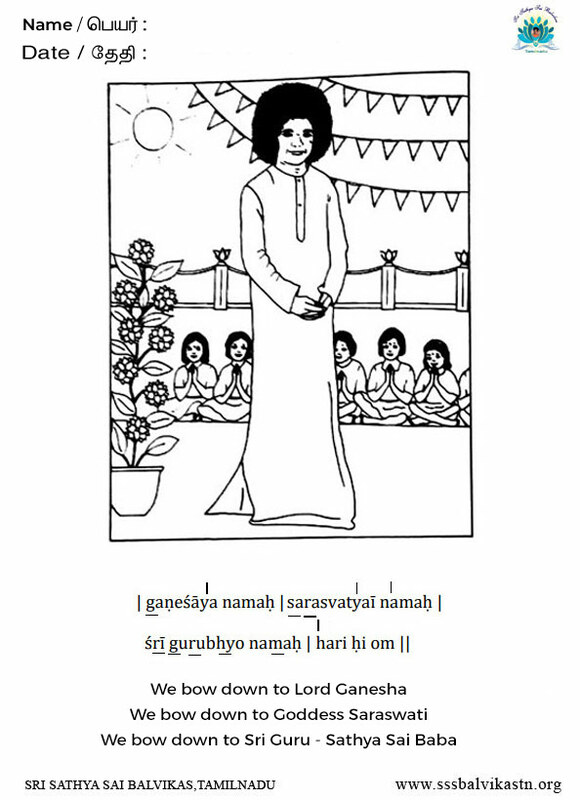 Alternatively, gurus can sing Ganesha bhajans and help the children to identify the different names of Ganesha in it. This is a game wherein children are given a few words in a sheet. Each word is inside a box. 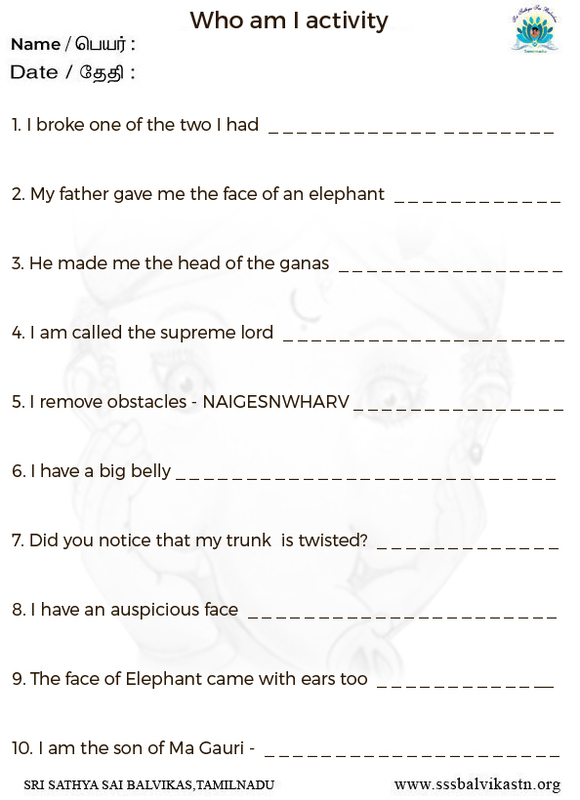 Children have to make two-word Ganesha name by combining any two words. For simplicity, the words given in the box that is sloping upwards is the first part of Ganesha's name. The words given in the box that is sloping downward is the second part of the name. eg: Vakra = First word and Tunda = second word. These when combined gives us the name Vakratunda. Alternatively, the teacher can use colour codes as well. All the first part of the name can be in red and the second part of the name black. Both can be done for clarity purpose. 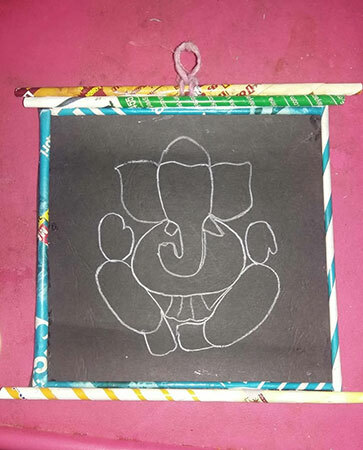 Children can be given freedom to make more than one name of Ganesha using the same word. 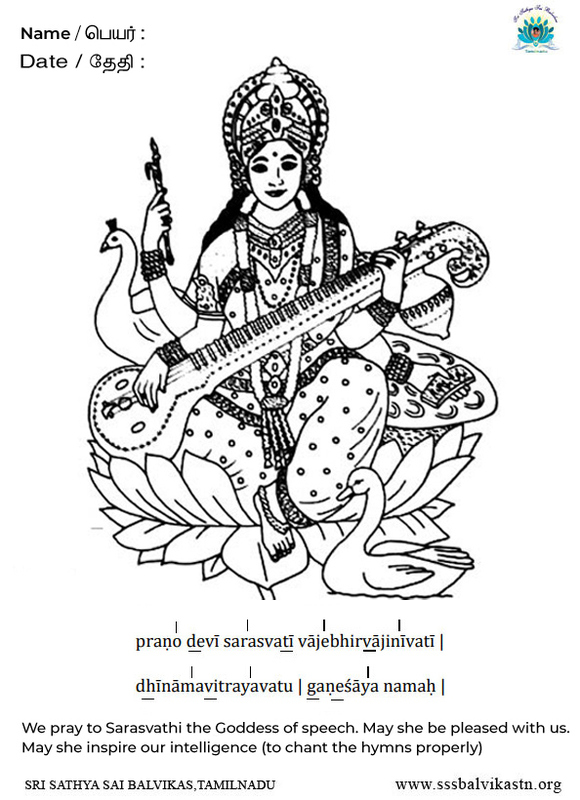 eg : Parvathi Tanaya ; Parvathi Nandana. Children can jot down the names in a book or paper. The child with the correct names and maximum names is the winner. 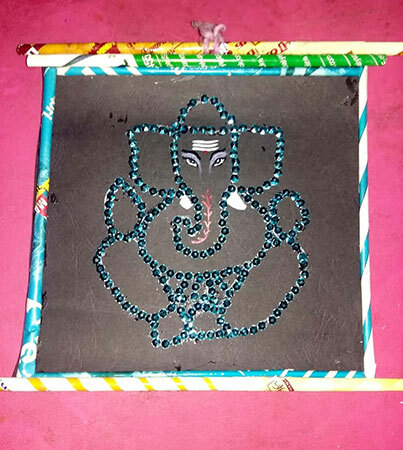 We are pleased to share the making of a vibrantGanesha wall hanging! This craft requires very basic craft material. It is also less time consuming as it can be done with the help of the cutouts made from the Ganesha template given. So grab a chart paper and get ready to start! 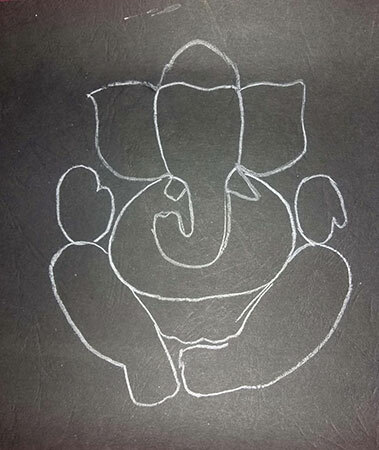 Draw outline of Ganesha or take a printout of the Ganesha template given below. Take a bright colored chart paper. Make cutouts of the template as shown , if you wish to trace the picture. 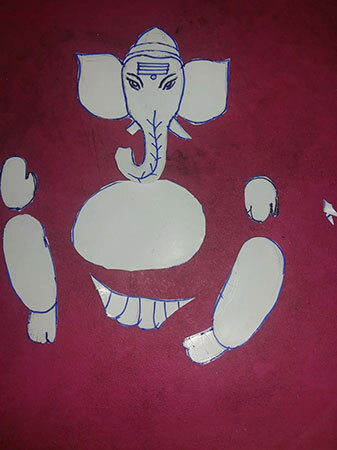 Trace the picture of Ganesha on the chart paper with the help of cutouts. Make thin rolls of newspapers and stick them together to make rod-like shape. Use this on all four sides of the picture of Ganesha to give a frame effect. Make holes at the centre on top of the chart and insert a piece of twine. Use sequences or glitters to decorate. 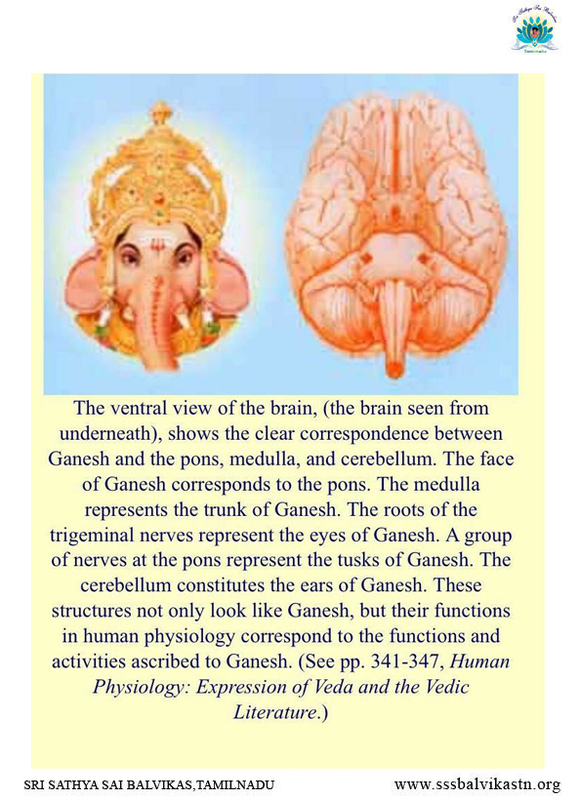 Highlight certain features of Ganesha as shown. 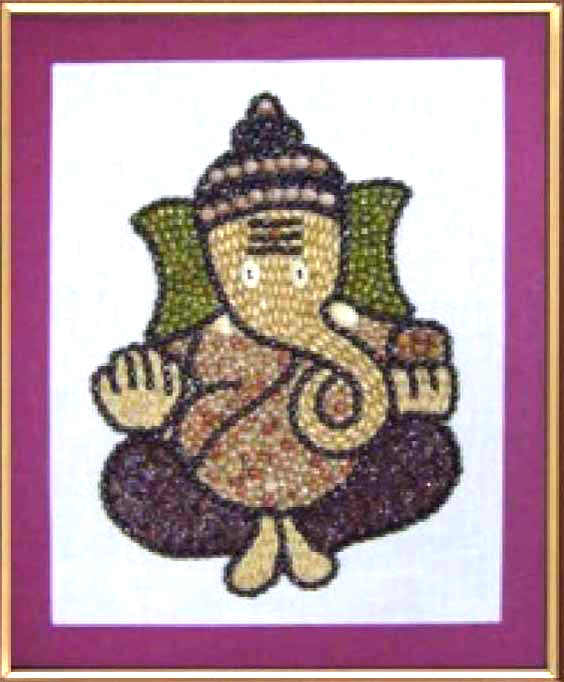 Your Ganesha wall hanging is now ready! 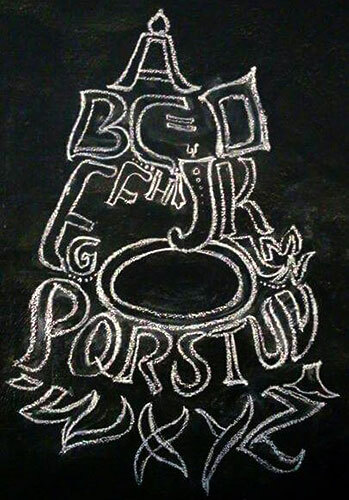 Gurus can eithershow the A,B,C,D Ganesha image or draw the same on the black board. Ask children to draw on the paper with pencil. Outline the drawing with sketch pens.